Under an azure sky stretching unblemished to Denali’s icy dome, the morning air crisp and fresh after autumn’s first frost, our tundra hike captivates the senses. We walk through a palette of gold, amber, and lime, serenaded by flocks of sandhill cranes winging overhead. The noisy wedges migrate south guided by the towering summits of the Alaska Range and other natural cues. 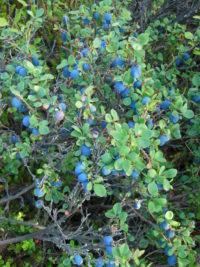 Our passage churns up the scent of blueberries, fallen leaves, and in places, crushed spruce boughs and rich, black loam. Parka squirrels stand sentinel by their burrows, chirping warnings as we pass. We flush a small flock of willow ptarmigan, already molting to white. Negotiating alder thickets we make noise to warn off bears; on open tundra we ramble, glassing for caribou. Every hike carries the promise of discovery but this one reveals the extraordinary. All antlered animals establish breeding dominance with head-to-head jousts, antler against antler, strength against strength. Not far from the undeveloped trail, just where the hills begin to flatten, I spy, in a tangle of golden willow, a splash of white, huge and immobile. Through binoculars, bleached antlers sharpen into focus revealing a charnel ground. We go closer, investigate. On the edge of a tundra ridge, the locked antlers and bones of two enormous bull moose lay on a thick bed of matted hair, the wind whispering news of a titanic struggle to the death. Last fall the bulls had slammed together in rutting combat, entangling their racks so tightly that no amount of their combined strength could pull them apart. Each rack spans 60-inches, the crowns of animals in their prime. All antlered animals establish breeding dominance with head-to-head jousts, antler against antler, strength against strength. How many times had these dominant bulls fought challengers, fended off rivals? How many times over the years had they broken free from contact without locking up? Injuries from sharp tines are common, punctures in the neck and shoulder, but death, mutual death, is rare. How many antlered animals meet their demise this way? No doubt only a few, and from my perspective, I hope mercifully few. The breeze stirs the sere grass, the drying leaves, and tufts of hair, lifting the scent of rage, turning to fear, and ultimately, catastrophe. The slide from battle rage to sudden, inextricable weakness must have stirred panic in these moose. I can only imagine the frantic efforts to break free, the yanking back and forth, to and fro, the tundra churning to mud beneath them. Which of them died first? And how? Did both bulls die of starvation? Exhaustion? Or were they crumpled powerless but alive on the tundra when the first wolves, or perhaps bears, raced to the feast? Scattered about is the spoor of wolf, grizzly, fox, wolverine, and the stains of gray jays and magpies. When each of these predators entered the drama is unknown. Perhaps the scavenging birds came first, but near a trail shared by people, wolves, and bears, we can only imagine. After discovery of this natural drama writ large, the remainder of our hike seemed almost anti-climactic. We watched a red fox hunting the scarlet tundra and cranes circling on rising thermals. On other hikes I’ve found owl feathers, bones of sheep and caribou, the skull of a bear, all grist for wonder, but never anything so powerful as this find. The seasons pass and news of the locked antlers spreads. The site becomes a destination, the undeveloped trail to Moose Creek a beacon. No one knows for sure who found the antlers first, but quite likely Simon Hamm of Camp Denali made the initial discovery in early spring, weeks before I found them. Others claimed the distinction. Designers working on the new Eielson Visitor Center planned to airlift the racks there to form a dramatic outdoor centerpiece. Others, including me, wanted them left in place, to allow other hikers to revel in a sense of discovery. A few demanded that the remains be left alone, the site a hallowed ground. Park visitors need not hike to see the entangled racks. The locked antlers are now on display in front of the Eielson Visitor Center in Denali National Park. 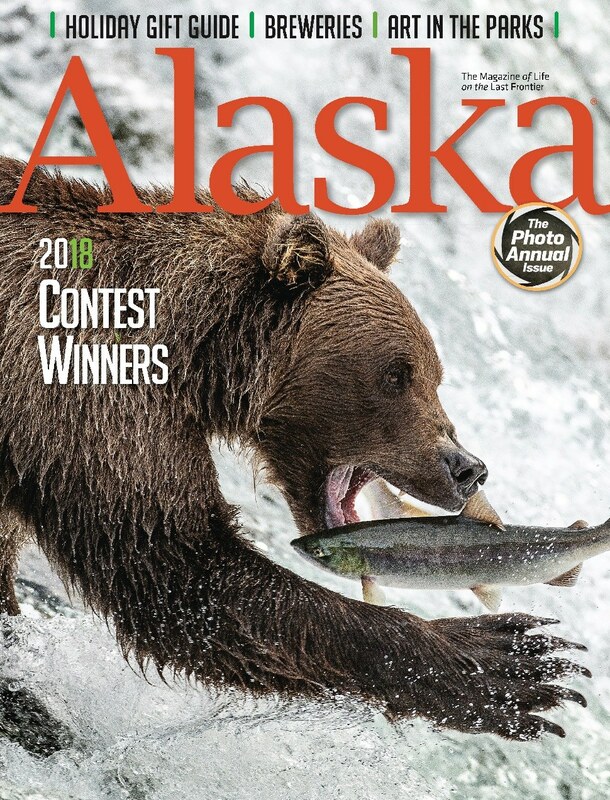 Tom Walker is a writer and nature photographer who has resided in Alaska for 51 years. This author of 14 books lives near Denali Park.